Ischia is a volcanic island in the Tyrrhenian Sea. It lies at the northern end of the Gulf of Naples, about 30 km from the city of Naples. It is the largest of the Phlegrean Islands. Roughly trapezoidal, it measures approximately 10 km east to west and 7 km north to south and has about 34 kilometres (21 mi) of coastline and a surface area of 46.3 square kilometres (17.9 sq mi). It is almost entirely mountainous, the highest peak being Mount Epomeo at 788 m. The island has a population of over 60,000 people. 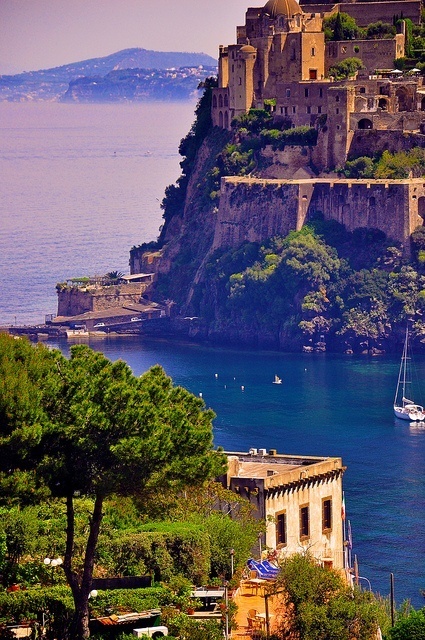 Ischia is the name of the main comune of the island. The other comuni of the island are Barano d'Ischia, Casamicciola Terme, Forio, Lacco Ameno and Serrara Fontana.